A shrimp boat travels along the Port of Brownsville ship channel to dock at the Brownsville Shrimp Basin on Thursday, Aug. 24, 2017. The Texas shrimp industry is celebrating a handful of recent legislative wins while also dreading next year’s shrimp season if changes aren’t made to the seasonal foreign worker visa program. 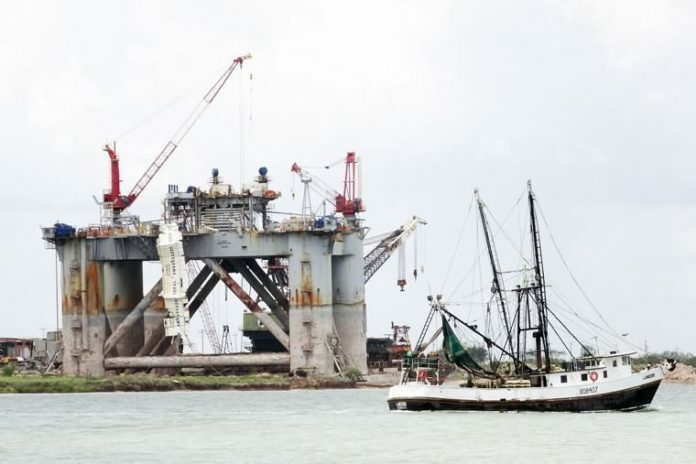 The Brownsville-Port Isabel shrimp fleet starts this season, which opened Sunday, without enough workers. Andrea Hance, executive director of the Texas Shrimp Association, estimates that 70 percent of the fleet’s 140 trawlers will head out to the Gulf shorthanded. That usually means having to do without headers, the crew members tasked with removing the shrimp heads before they are frozen at sea. Hance said headless shrimp bring $1 to $1.50 more per pound at the dock compared to shrimp with heads. The seafood industry, like the landscaping and hospitality industries, relies heavily on H-2B visa workers to function. Most of the Texas shrimp industry’s H-2B workers come from Mexico. The cap on H-2B visas is 66,000 per fiscal year, split evenly between the first and last half of the year. With more than 200,000 applications from employers for H-2B visas this year, the cap isn’t cutting it, Hance said. “There’s been such an increase in demand,” she said.